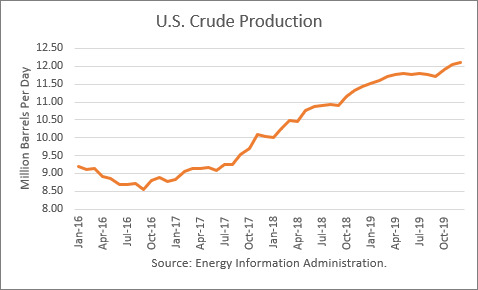 The Energy Information Administration reported that May U.S. crude oil production averaged 10.442 million barrels per day (mmbd), off 30,000 b/d from April’s all-time record high of 10.472 mmbd. However, May’s production was also lower than 10.461 mmbd posted for March. From December through March, production had spiked by 423,000 b/d. Part of the explanation for the lack of continued growth is the unplanned maintenance in the Gulf of Mexico. Last month, GOM production dropped by 75,000 b/d. In April, it had declined by 99,000 b/d. 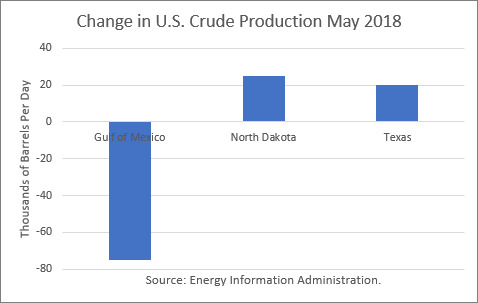 In EIA’s Short-Term Energy Outlook, May’s GOM production was forecast to increase by 200,000 b/d from April. Otherwise, increases in North Dakota (25,000 b/d) and in Texas (20,000 b/d) were also relatively modest. The EIA-914 Petroleum Supply Monthly (PSM) figure was 304,000 b/d lower than the weekly data reported by EIA in the Weekly Petroleum Supply Report (WPSR), averaged over the month, of 10.706 mmbd. EIA’s most recent weekly estimate for the week ending July 27th was 11.0 mmbd. The May figure was nonetheless a year-over-year gain of 1.265 mmbd. And the EIA Drilling Production Report estimates a 143,000 b/d gain for August. Looking further ahead, the EIA is projecting December 2018 output to rise to 11.430 mmbd, up 1.40 mmbd from December 2017. In addition, EIA projects that other supply (liquids) will rise to 6.92 mmbd, up 630,000 b/d from last December, for a total gain of 2.063 mmbd. The biggest concern about realizing these forecasts is infrastructure constraints in the Permian Basin. The recent slowdown in oil rigs being added appears to justify that concern. The large divergence between the weekly and monthly estimates for May calls into question whether U.S. production growth really is as strong as the EIA has been estimating, or whether it is largely explained by unscheduled maintenance and deliverability issues. 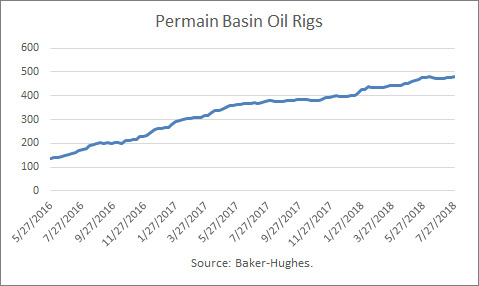 There is a large addition to pipeline capacity scheduled for 2019, but that is quite a bit down the road from here.